Ah, hello there, you look new to me. Are you? OK, I suppose I’ll show you around then; it’ll be good to use a few minutes. This is the Scrap Heap. Yeah, that’s its proper name, capital letters and all. It’s not just any old junkyard, this is the land of the unwanted, the possibly useless, and the uselessly impossible. It’s an interesting place, maybe you’ll like it; you never know, some people seem to. Some people. This part isn’t much to look at; this is the resting place of all the unsorted and the truly useless. You won’t want to stay here long, it’s no good at all. This is where the unwanted, lost, and the broken fall. Yes, I’m afraid you certainly fall into one of those categories; it’s up to you to decide which. All the untethered odds and ends from the other place slip through the cracks to here, and this is where we remain. Anyway, follow me, there’s more to see. This is the Junkyard. Some folk make it their life’s work to sort junk from the unsorted scrap and put it into neat piles here. Look, a perfect pyramid of unwanted wooden sculptures, and somewhere over that hill is the pile of forgotten inventions, never fully designed. I’m pretty sure there’s a pool of childish hopes to the east of here; some folk holiday there. Why would junkers spend their life sorting all this? Well, you’ve got to do something, no? There’s no ending to this place; no changing of the sky, there’s just the endless ocean of scrap, and time. We can’t die, can’t sleep, so why not sort? At least, that’s what some choose to do. I don’t, obviously. Not for you? No worries. We’re passing by one of my favourite places next, maybe you’ll like it. This is the Studio. Maybe you noticed the Junkyard didn’t have any media; no books, no movies, no archives of understanding. Well, the Studio has a solid claim on all of that. Within the Studio are entire libraries of novels left unfinished, archives of forgotten knowledge, an entire wing dedicated to the futures of failed careers. It’s a very welcoming place; if you ever feel the need to spend some time elsewhere, you’re welcome to enter and consume as much as you want. Some spend every moment of their existences in the worlds of other peoples’ designs; the Studio archivists aren’t keen on them, but they’ll not stop you if that’s what you want to do. 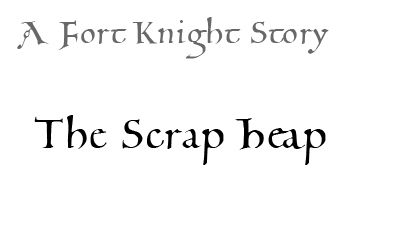 That’s an important aspect of the Scrap Heap. We’re all here indefinitely, we’re all just stuck; so we never prevent others from doing what they have to do. We cannot physically harm each other, so we let people do as they will with their own eternity. It’s a system of respect, I suppose. There’s a few who spend their entire existence destroying and tearing things apart; Wreckers. It’s just what they do; so we let them be. There’s others who live to repair what the Wreckers wreck, so I guess it all works out anyway. Me? Well, I spend my time guiding others through the Scrap Heap, introducing them to all its curiosities. Folk who fall into the piles of unwanted and aren’t given any guidance tend to spend quite a while in a panic, uncertain of what they’re doing or who they even are now. What’s that? Oh, I don’t like that place, but sure, let’s go take a brief look. We don’t talk to folk who live here, so I’m not sure what they call it, but we call it Void. Void is a massive emptiness; some unbound nothingness from before the Scrap Heap. We dump troublesome concepts or ideas we can’t quite fathom in here, where their screams are quietened. I’ll never understand why, but a few sorry sorts choose to spend all their time within the cold embrace of Void. They seem to like the quiet; they drift within nothingness, forgetting they even exist for great spans of time. Some go in seeking out the unquiet ideas we hide here; desperately searching the most painful, unwanted knowledge. I’ll never understand them; can we go? So, this is the Scrap Heap. There’s all sorts here; whatever your fancy, you’ll likely already find some folk trying to make their way here doing it. You’ve all the time in the world; where would you like to begin?